As a creative jazz musician and New Orleans’ keeper of the free-jazz flame, Edward “Kidd” Jordan is an anomaly of sorts in the birthplace of jazz. One is actually more likely to hear Jordan blowing out on stages in Chicago, New York or Europe than in New Orleans, where traditional, brass band and straightahead jazz reign. Earning a living as a professor of music at Southern University of New Orleans (SUNO) for over 40 years, Jordan cares little that his hometown is so nonchalant about his music. His real concerns are providing for his family-his musical children, flutist Kent, trumpeter Marlon and vocalist Rachael-and blowing his horn. Not dependent on monetary considerations connected to his musical performance, Jordan is free to pursue the music without compromising to record companies’ or audiences’ whims. Teaching at SUNO as well as acting as director in youth-oriented programs at the Heritage School of Music and the Louis Armstrong Jazz Camp, Jordan is seldom without his horn in hand. 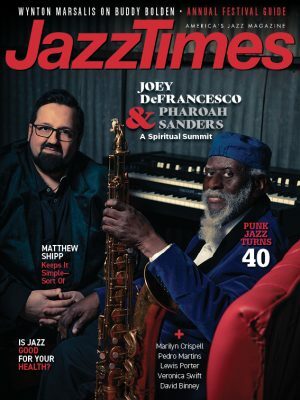 When Jordan does climb on stage with his and drummer Alvin Fielder’s Improvisational Arts Quintet or kindred artists, like pianist Joel Futterman or fellow tenorist Fred Anderson, his passion is immediately evident. While he digs down on his horn, exploring jazz’s outer reaches, he’s up on his toes with the exhilaration of playing a flurry of notes on the high end of the tenor. Jordan’s stamina is stunning as is again exemplified on last year’s release, 2 Days in April (Eremite), an album with Anderson, drummer Hamid Drake and bassist William Parker. The two-disc package was recorded in April 1999 at the University of Massachusetts in Amherst and at the Massachusetts Institute of Technology in Cambridge. Following a call from Drake’s insistent drums, Jordan is the first to jump into the rhythmic melee, eagerly taking up the challenge with his raging upper register. Like all of the material on the album, the first selection is named simply by its length, “17:26.” There are no tunes on 2 Days in April; there wasn’t even a preconcert discussion about how long the sets would be, which musician would begin playing or talk concerning tempo and rhythm. Jordan hopes that all his future releases are recorded in the same manner as 2 Days in April. While in the past the saxophonist has utilized tunes on albums even in free-jazz situations, it’s the immediacy of creating in the moment that makes his spirit soar. Jordan’s wide musical experiences take various forms as they enter a free situation. Touches of funk and blues make appearances in the music alongside the influences from Jordan’s many years blowing with members of the AACM. Like so many New Orleans jazz musicians, the saxophonist was active during the city’s R&B heyday in the late 1950s and early 1960s. His horn backed artists like Fats Domino, Big Joe Turner, Ray Charles and Guitar Slim, while after hours he’d dig into jazz. Occasionally, Jordan still works in a big-band reed section, usually blowing baritone sax, backing up touring artists when they come to town. The saxophonist’s link to Chicago has been particularly strong and long-lasting. 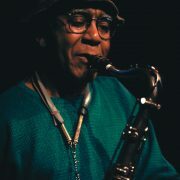 He met many of the Windy City’s more progressive players, including many AACM members, while attending Millikin University in Southern Illinois and studying privately at Chicago’s Northwestern University during the 1960s. Many of these musical associations continue today. Jordan was a mature musician, playing mostly alto and struggling to find a different direction when he first heard Ornette Coleman. “When Ornette Coleman came on the scene, that was like an angel that fell from heaven,” says Jordan, who soon thereafter switched from alto to tenor. In the classroom, as on the bandstand, Jordan doesn’t pull any punches. His strong voice and serious demeanor can be intimidating. Yet there is something personable in his hands-on approach and his mindfulness to each individual pupil. With his students, the emphasis is strictly on basics: fundamentals and technique. Even in New Orleans, few people are aware of another of Jordan’s passions: raising thoroughbred horses. Born in the Louisiana countryside, Jordan had horses when he was a child. More recently he teamed up with his nephew and the two now own, care for and race 10 horses. Jordan uses his experience breeding horses as a metaphor for what he sees as a problem in jazz education in today’s schools. A resurgent interest in creative music, particularly by a younger crowd, is evidenced by Jordan’s increased activity both on the performing and recording fronts. Once or twice a month Jordan heads out of town for gigs and/or recording sessions. In part, he credits New York’s Vision Festival for exposing the music to larger audiences, which in turn creates more opportunities. Though gigs in his hometown remain few, Jordan is a frequent participant at a budding weekly creative jazz concert series presented by the Zeitgeist Multi-Disciplinary Arts Center. At a concert in Boston last December, Eremite rolled tapes for another live album that will be out sometime this year that teamed Jordan with alto saxophonist Marshall Allen, drummer Alvin Fielder and the basses of William Parker and Alan Silva. The Kidd Jordan Quartet, with Fielder, Futterman and Parker, has a new CD on Silkheart, New Orleans Festival Suite. Kidd says he doesn’t listen to recorded music-too busy playing. Selmer Mark VI tenor. Fred Hemke reeds. Brilhart mouthpiece.